Rioja, Please Tell Me Who You Are and How I Define You! Having just arrived back from the Grandes de la Rioja Wine tasting this past week in Logroño, I’m still a bit befuddled as to how one might define Rioja. When I first started in wine, I was told by many a mentor that Rioja was a region of dried out wines that were over-oaked. The truly exciting wines were from the innovative wine makers working to re-integrate the fruit. When I eventually arrive in Spain, for obvious reasons, I braced myself for wines that were aggressive and lacking character. And although these wines still do exist, I discovered they are fading into the distance. I also realized that mentors can be wrong. Wines from Rioja can be extraordinarily light and delicate, with aromas that herald the dried out metaphors they espoused. And even with this gentle profile, they have an uncanny ability to express both depth and passion. We’ve talked about it before, old style Rioja vs. new style, and I have to say, both have merit and interesting features; and yet, I tend to find the old style Rioja more to my liking, demanding my attention with every sip. Tondonia, Murrieta, Muga, Riscal and La Rioja Alta, almost all make modern style wines, but it’s their traditional wines that beguile me and tug at my heart strings. While regional newcomers, such as RODA, Obalo, Luis Alegre and many more, opt for a less traditional wine style, focusing on the fine fruit available from this region, which create big powerful wines with structure and thick fruit, a style that could come from almost anywhere on the planet. In this case, I find myself asking, why Rioja? And if you will indulge me, I personally would answer, “Why not? Just please make sure to pass me the old stuff.” Here’s why I say this. While I accept that wine is a liquid with flavor, and regardless of how or where it is made, it can be enjoyed, I want to believe I have a bit of a romantic still left in me. I don’t mind drinking wines that are ripe, powerful, and occasionally over the top, nor do care where these come from, at least most of the time. I can enjoy these wines as I enjoy other consumables – expressions of flavors, nothing more, nothing less. Like a good baguette, it may taste better depending on the baker, but not necessarily depending on where the baker made it. I eat and drink these non-location specific foods and wines because they taste good, are well made and bring enjoyment. That said, when I want to drink a regional wine, or eat a regional food, I expect that they will reflect the land where they are made. For me, this is why I want my Riojas a bit more traditional. I want to drink a wine that has some age on it, where leather is the flooring that fruit and spice mingle upon. There was more than one occasion on this trip that we tasted a young wine that was so powerful and full of oak; intense and over the top; and where wine professionals with much more experience than I would say, “In time the oak will integrate and this will become a traditional wine, of the highest caliber…”, to them I say, I’m sorry. I’m sorry that these wines are being made by wineries who are pushing sales and looking for Parker points so as to sell out asap. Truth is they will most likely be consumed well before their “true expression” even begins. And they may never become the beautiful creatures some think they may be. I might talk more about the 114 wines we tasted in Rioja, outside of those tasted at the wineries, but before I do, I want to end this post with one last important thought. On our second day, we visited Viña Tondonia where we strolled through the historic working cellar, thoroughly enjoying our time listening to stories about their living past. After which, we ended our tour with a tasting that really amazed me, and I feel fortunate to have taken part in. We were poured a 1961 Tondonia Gran Reserva, and then both a white and red 1981 Gran Reserva and then finally to our delight, three wines from 2009: a Graciano, a Tempranillo fermeneted in a small barrel, and a Tempranillo fermented in a large barrel. Here is a winery that does not release a wine for a minimum of 10 years after vintage, letting us taste their true expression. The wines that give birth to the treasures so many have come to covet and love. These are wines that in 2020 will be deemed ready for their release. Guess what? The wines were gorgeous. No heavy oak that needed to integrate. No over extraction that needed to dissipate. Instead, we found wines that showed big tannins, noticeable wood on a few and amazing spicy fruit. These were wines that Anthony Rose lamented were sadly not available now to buy, were in a word delicious. It makes me wonder if oak really does fade, if over extraction is okay, and if cough syrup fruit can mellow out with enough time. Maybe it does, but for now, I’ll keep asking the questions. And opting for more balanced bottle. 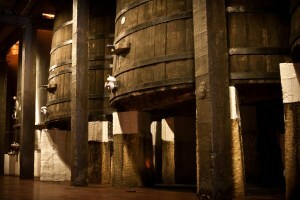 In the meantime, if you want to explore the vast array of Rioja wines, why not join us an a customized wine tour? !